Between the 1960s and 1980s, approximately 20,000 Indigenous children were taken from their homes and communities and placed in foster care or adopted to primarily white families in Canada and the United States. Now known as the “60s Scoop,” it was an effort to assimilate Indigenous Peoples and culture in Canada, and its effects are still felt by survivors and communities today, with Indigenous children continuing to be overrepresented in Canadian child welfare systems. Colleen Cardinal, a Plains Cree 60s Scoop survivor, co-founder of the National Indigenous Survivors of Child Welfare Network and volunteer organizer at the Families of Sisters in Spirit for missing and murdered Indigenous women and their families, has embarked on a project to map the movement of 60s Scoop adoptees. She is gathering stories and data for her map, which is still in the conceptual phase, in collaboration with friend and academic Raven Sinclair’s Pekiwewin Project. Here she discusses her map and her personal connection to the 60s Scoop. My sisters and I are from Saddle Lake Cree Nation, which is about 1½ hours northeast of Edmonton. We were taken from our parents when I was a baby. We were put into foster care and from there we were adopted and taken to Sault Ste. Marie, Ont. We were raised in a very, very abusive home. All of us ran away, three by the time we were 15 years old. One of my sisters ended up moving back to Edmonton to look for my parents. She went downtown and just started asking people if they knew them. And she found them. At that time, unfortunately, my mother, who was also a Residential School survivor, was self-medicating with alcohol and solvents. She never talked about anything, really. It was such a painful thing for her. Of course, I didn’t know that at the time. I had no context, no insight and no money. By then my father had sobered up. But I never really got close to him. He’s more like a friend to me than anything. My older sister was killed in 1990, a year after we repatriated. It was very difficult. I do a lot of work educating people about how child welfare policies have impacted missing and murdered Indigenous women, and how a lot of us have grown up in violent and abusive homes. We end up fleeing those homes, only to be killed by or to die violently because of people we interact with. There’s a huge connection there, and a lot of my work is inspired by my sister. She was a fighter. I think she would have wanted people to know about the extent of the 60s Scoop. She would have been very vocal about telling our story, making sure that people knew that something happened to us and that a lot of it isn’t our fault. I’m grateful for being in the position today to tell this story and do this work. There are a lot of survivors still struggling and that’s what drives me. I’m very fortunate now, but there’s lots of work left to be done. Lots of people need to be educated. I was 28 when I first started learning about the 60s Scoop. I went to Sault College in Sault Ste. Marie and I took the native community and addictions counsellor program. That was also the first time I ever heard of treaty rights and it was the very first time I had heard of residential schools. I was blown away. How come nobody told me this? At that time, I had already met my birth parents. My mom had died in 1999, and she never talked about it. Survivors didn’t talk about it because it was such a hurtful time. Up until that time, I thought my sisters and I were pretty special. I thought we were the only ones who were raised in a white home. I was kind of proud of it. I had internalized a lot of racism. So when I found out about the 60s Scoop, I said, “I think I’m part of that.” And then I found out that there were about 20,000 other adoptees like me. The number was staggering, and we still don’t even know if it’s accurate. Up until that point, I also hadn’t known how far away we were sent. Hundreds — even thousands — of Indigenous children were taken overseas by their Canadian adoptive parents, or directly adopted to families in the United States. We’re the original people of the land. What were we doing being shipped all over the place? We were advertised through newspapers and television, like how you would for a pet. For example, “Unwanted children, need good home. Save their lives and make them happy.” No effort went into keeping our families together and providing addictions services or anything like that. The Canadian government just took kids right out of homes and sent them off to live with white people so they could be assimilated. The feds and the provinces put a lot of money and effort into trying to assimilate us. They wouldn’t say it like that, but the intention was there. So there are hundreds and thousands of children — now adults — out there, looking to come home. And they don’t even know where they’re from. When I moved to Ottawa, I started meeting more and more adoptees, and as I shared my story online, more and more adoptees started contacting with me through Facebook, telling me they were taken to England or New Zealand or Australia. And I thought, what does this look like? I decided to show our displacement at an international level on a map in collaboration with the Pekiwewin Project, a five-year project to understand how Canada’s Indigenous policy has resulted in a national Indigenous child removal system. I’m creating the map with the help of the Firelight Group and GeoLive, a University of British Columbia mapping project. It’s going to be shameful for Canada to see it, but it’s going to be a tool for us to educate, collect data and share our stories. Survivors can also use the map to look for information about themselves and their biological families. There are still people looking for their siblings and their parents out there. And the map will be a tool to see where these kids were taken from. We know that the children were predominantly taken from Alberta, Saskatchewan and Manitoba, and that most of them were placed in Ontario homes and in the United States. The thing about being a 60s Scoop survivor and being raised in a non-Indigenous environment, along with the loss of culture and cultural identity issues, is feeling like you don’t fit in anywhere and that you have no one to talk to. Nobody can really relate to that apart from other 60s Scoop survivors. You don’t feel like you fit in with your white family, even though some families were great to the adoptees and provided love and support. And you may not have support from your biological family either. Adoptees also have to navigate those weird relationships with their families, one or both of which could be very dysfunctional. 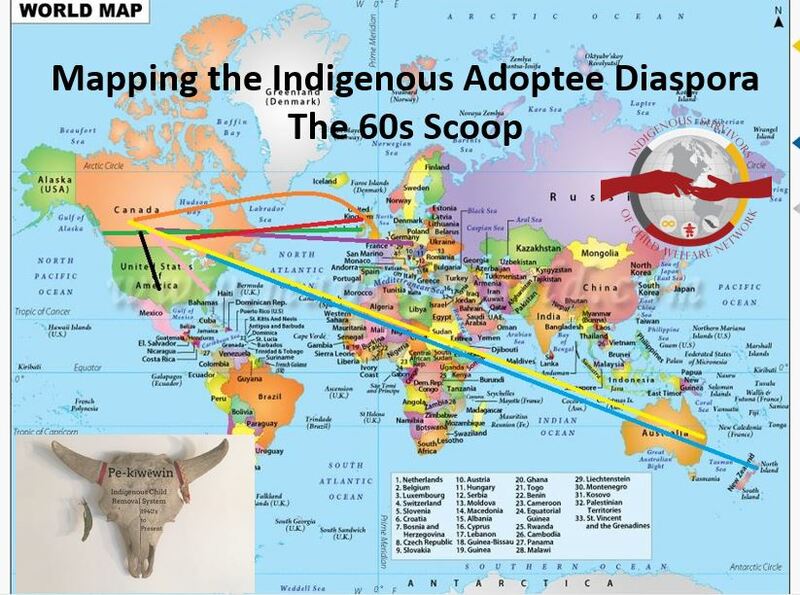 The map will build a community for 60s Scoop adoptees across Canada and internationally. It says, “Look, here we are. We’re over here.” That’s so more people like us will know we’re not alone, and so the government can’t just roll over us by arguing that there are more kids in care now than there were back then. The government still needs to deal with us. We’re still here. 60s Scoop adoptees can take part in this mapping project by submitting their information through the National Indigenous Survivors of Child Welfare Network.